Synopsis: A badly injured Lupin is rescued by Fujiko, who wisks him and Ami away from the palace, pursued by the High Priest's forces. Dolma has been working with the CIA and the High Priest to overthrow Padar's government and take the throne as a puppet in exchange for the sparing of her father, the king's, life. Her father, in the meantime, has cozied up to the Shake Hands tech corporation, run by a man with ambigious intentions. After removing the arrow from Lupin's abdomen and running a ways with him and Ami, Fujiko seemingly abandons the two to draw the fire of the High Priest's men, but Lupin springs back into action to help her. Will he get her out of danger in time? Fujiko's fiercer than ever in this dash to safety as martial law is declared! This episode is one of my all-time favorites in this franchise. It's an exquisite work of art. This is peak Lupin III. The first two parts of this arc saw an examination of the differences and similarities between Fujiko and Ami, with Lupin's determination to get the Bloody Teardrop as the story engine. 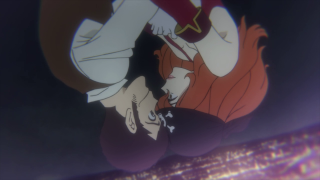 In the first episode of it, Lupin's mission was more of a framing device, not blooming until the second episode, where it ran parallel with Fujiko and Ami's goals. 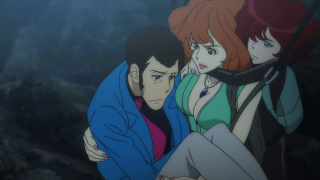 But here everything has become intertwined as Fujiko is confronted about her attitudes towards Lupin while Lupin recovers from an injury during his attempted heist (of the jewel or the girl?). Ami is the medium through which Fujiko is forced to consider her relationship with our favorite purloining pal, at every turn wondering what the dynamic is between this crew, while also experiencing more of the outside world than she ever thought she would. Ami has gone from a curious fascination with Lupin to kind of a feeling of admiration for his inventiveness and boldness. She looks up to him, in a way, and Fujiko seems suspect to her. She wonders if Fujiko is just an attractive lady, a bauble for Lupin to chase after, or if their relationship is more than that, and when she sees Fujiko's use of her whiles to deceive all, it's hard for her to reconcile her opinion of Fujiko with Lupin's. Here, just as she's begun to see something in Fujiko, she appears to be betrayed by her (but Fujiko's really drawing fire away from Ami and Lupin). 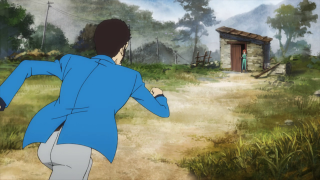 We don't often get an outsider's view of, "Who are these two people, Lupin and Fujiko, to each other?" We get the cynicism of Lupin's other partners in crime all the time, or the fleeting assumptions of common enemies, but nobody has seriously questioned why it is that Lupin and Fujiko are always in each other's orbits. This must be especially perplexing to Ami, a girl who's lived kind of a sheltered life, even if she has endured abuse and exploitation (and perhaps because she has). What little we get of Jigen and Goemon actually brings up an interesting question as well, as Goemon muses on the nature of their relationship with Lupin. Let's look at what's happening in this heist. Lupin left the two behind when he infiltrated the palace. It happens. Sometimes Jigen and Goemon are more of escape plans than active in the physical stealing of the object in question. Goemon wonders, what if Lupin has never really needed them to begin with? We've certainly seen how resourceful he is, but then again, he can still be caught off guard, as he was with Dolma. If this arc has ANY flaw, it's that there's not enough for these guys to do. The startling twist in the plot is that Dolma is not only supporting the High Priest's coup to ensure the rebels won't kill her father, the king, but even within that she's planning on taking charge with the help of Ugo, one of the CIA assets that's assisting with said coup. Plans within plans for our bold princess of Padar. Of course, she could have simply shot the arrow into Lupin's shoulder or arm, instead of his damn abdomen, to make her point (lol). I know he's a thief ostensibly there to get her jewel, but she can see that Ami is fond of him. 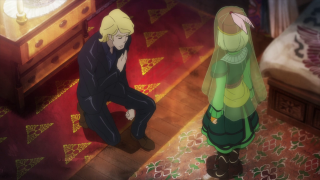 Naturally, I doubt the High Priest or his military junta are interested in Dolma's request to spare Ami, or anyone else working with the Lupin gang. And somehow I don't think they'll be sparing her father, either. Speaking of her father, though, it's not as though the people he's teamed up with are that great, either. Sure, making Padar a high tech country is pretty neat, especially for a clearly developing country, but it's becoming a bit clearer that they're being taken advantage of by these smooth talking techies. 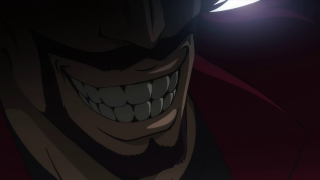 Clearly something is up with that Enzo guy who runs Shake Hands and has the most brazenly wicked smile ever put to animation, but it seems like this whole internal strife in Padar is between two bad options. It's clearly becoming either a military state or a technological surveillance state, or maybe both, and neither is great. We'll have to see what Lupin and Fujiko plan to do about all this next time, in addition to seeing how they managed to survive that blimp crashing into them. Judging by the preview of the next episode, the political situation is about to explode. Is that jewel worth it? 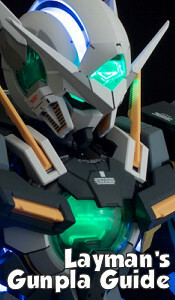 Or is Lupin doing this for something else? It's one troublesome job. But they're rarely easy for the Lupin gang. I loved this episode. Fujiko's continuing escape from the Padar army, whether it be in the sky or through the streets, is exciting, especially since she's kind of inducting Ami into the life during it. There's plenty to chew on in terms of the political maneuvering and the relationship dynamics, too. I just hope the rest of the storyline lives up to its potential for further growth. If it can keep up this level of quality, Lupin III Part V will probably go down as my favorite of the Lupin shows.